Shortcodes Ultimate offers 40+ free features in a single pack helps to avoid installing multiple plugins to get those features. Plugin has easy to use interface with free features are completely free with separate add-ons for upgrade. This is recommended plugin for WordPress users if the listed features are the ones you are looking for. The power of WordPress is the features it offers and the existing readymade plugins will mostly satisfy your need to build a wonderful site. Besides various features adding shortcode is the one of the ultimate thing WordPress offers which remove the worry of actual coding behind and function and enable the function just by adding a shortcut. Though most of the themes provide special shortcodes by default there is a one plugin provide all type of features under a single umbrella. It is Shortcodes Ultimate WordPress plugin which can be freely downloaded from WordPress plugin repository. What are the Shortcode Features it Offers? Shortcode Ultimate offers more than 40 shortcodes as shown below. The advantage of this combo pack is that it will reduce the need of adding many individual plugins. For example, you can easily add tooltip, buttons, tabs, accordion or dropcap which if you may not get in any other single plugin. Shortcodes are classified under different heads like Content, Box, Media, Gallery, Data and Other. Clicking on the tab will highlight the available options for that corresponding selection. 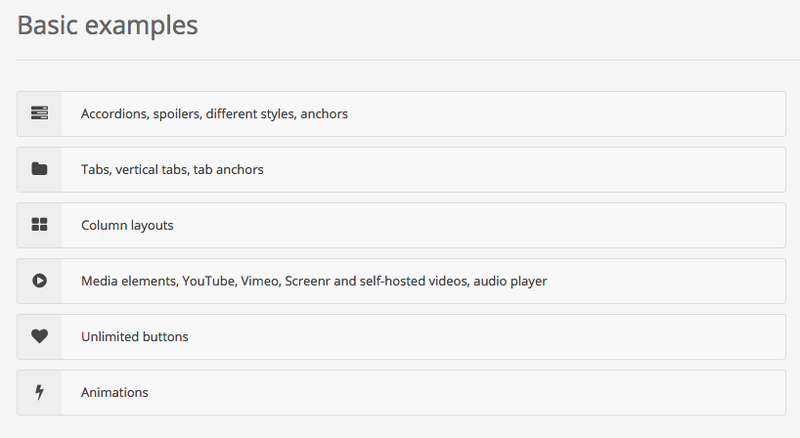 Though there are 40+ free features available in the plugin there are some interesting features to enhance your site. YouTube advanced video embedding option allows you to create a playlist with multiple videos, hide the video controls and make the video responsive to play on mobile devices. Column option allows adding responsive column layouts to your site. Buttons allow you to add different type of CSS buttons with icon front of the text. Tooltip allows you to add instant tooltip pop out for any words on your site without the need of additional plugin. Easy to modify original CSS files to customize the style of each elements. Shortcode Ultimate plugin can be downloaded from WordPress plugins repository within admin dashboard like any other free plugin. You also have an option to download it from the developer’s site and upload the plugin zip file to server through admin dashboard or using FTP. The success of Shortcode Ultimate plugin is the easiness to use. Once installed there will be an “Insert Shortcode” button added in WordPress post editor which can be used to add the required shortcodes instantly. There will also be a new menu “Shortcodes” added in admin dashboard navigation section. There are plenty of examples and cheat sheets with actual shortcodes which you can just copy and paste between your content to insert that function. Why Shortcodes Ultimate Plugin is Recommended? There are very simple and logical reasons why do you consider installing “Shortcode Ultimate” plugin if it suits your need. Updated frequently with 300,000+ active installs. Developer tested the plugin for the next WordPress version. (The current WordPress version is 4.1.1 when we write this article but the plugin is already compatible up to version 5). Refer “Reviews and rating” section in WordPress. Though there are many unresolved queries in the support forum, most of the features are working fine when we tested the plugin with various themes. Features are responsive and suitable for mobile devices. Shortcode widget makes your life easier to add features in sidebar and footer area. Free features are white labeled without any backlink or upgrade option (Add-ons are offered separately). Easy to use with the sample code. In most cases you just need to copy and paste it assuming you did not change the shortcode prefix under “Shortcodes > Settings”. Below are some examples created with extra set of shortcodes ultimate plugin. This is definitely one of the best free plugin for shortcodes, but nowadays all themes have built-in shortcodes so there is no separate need of plugin.